Announcement Welcome to Spoonier! 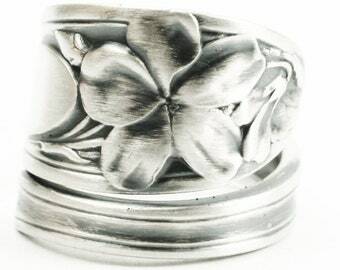 Home of the largest selection of Sterling Silver Spoon Rings Handmade from Vintage Spoons Anywhere! Repurposed flatware handcrafted into Stunning Jewelry with a Timeless and Unique look that is, Sizable to Anyone's Build, Stylish as well as Eco Friendly! 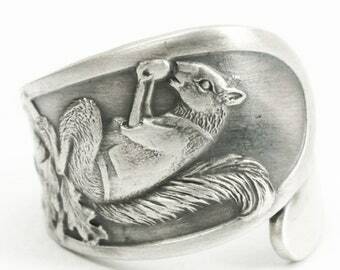 Here at Spoonier on Etsy you'll find solid sterling silver; Victorian, Floral, Animal, Masonic, Art Nouveau and Art Deco spoon rings, and many other styles. Our favorites are detailed floral and figurative spoon rings, from lilies to daisies to chrysanthemums, and from goddesses to farm animals! Our organic designed rings hearken back to a time when silverware design was not only seen as art, but also as a celebration of nature and progress. 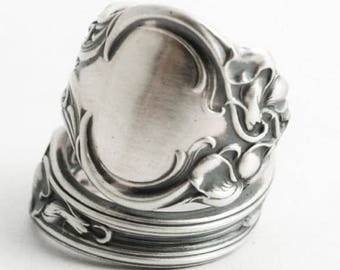 We specialize in unique and unusual sterling silver spoon jewelry. TIPS FOR BROWSING OUR STORE: Utilize the sections on the left to narrow it down to the style you like best. Or send us a message! If you don't see the ring you liked anymore, send a message too! Welcome to Spoonier! 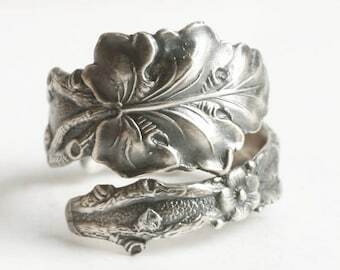 Home of the largest selection of Sterling Silver Spoon Rings Handmade from Vintage Spoons Anywhere! Repurposed flatware handcrafted into Stunning Jewelry with a Timeless and Unique look that is, Sizable to Anyone's Build, Stylish as well as Eco Friendly! Beautiful bracelet made a lovely birthday gift. Woman’s face and beautiful flowing hair in an art nouveau design make this ring stand out. Seller shipped it very fast. Thank you Spoonier! Cyber Monday Sale!! 15% Off Everything in our shop Plus Free Domestic Shipping for a few days while the sale lasts!! And you can still get 20% off orders of 3 or more items in your purchase for a few more days! Happy Fall! The best time of year! Want 15% off your purchases over $10 until Halloween? Enter coupon code 15PUMPKINS during check out! 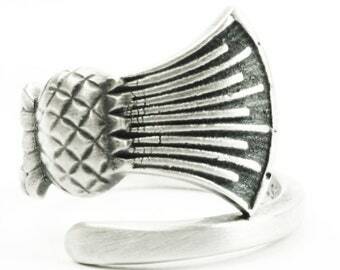 The majority of our Spoon Rings are bent Directly from Spoons, but we also offer Recycled Spoon Sterling Castings. We ship all of our orders in little velveteen bags with a Spoon & Fork box and a flyer. Never with an invoice. Choose from one of our 3 different Finishing Options (or none), after or during check out. We try to find the most unique an beautiful sterling spoons ever made from the turn of the century. Tami is the Voice of Spoonier as answering all of the questions as quickly as she can! Spoon bender, metal melter and quality controlled shipping. She loves her children Arwen & Lukas, music, art, good food, and unique fashion. Mike is the founder of Spoonier! He finds and buys all of the amazing spoons we transform into jewelry. He directs our Lost Wax Casting mold catalog. He loves good food (especially cheese), traveling and photography and of course Art Nouveau fashion. Melody is a machine on the bench and has quickly learned how to produce high quality spoon rings. She also helps with shipping. She has a background in working with her hands and creating art for many years. Travis is our new caster and master wax worker here at Spoonier. He has been working with high end jewelers for years and we're lucky to have him on our team to expand Spoonier's casting quality, and to up our production abilities. Craig helps with spoon ring production part time. He loves fossils, and photography. He has traveled to Australia to mine for gold and opals. Craig also enjoys Fire Spinning, Poi, good music and good food. 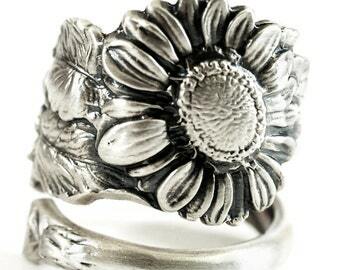 Welcome to Spoonier, home of the Largest Selection of Handmade Vintage Sterling Silver Spoon Rings Anywhere! 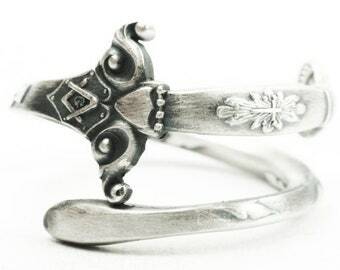 Re-purposed Flatware Handcrafted into Stunning Jewelry with a Timeless and Unique look that is, Sizable to Anyone's Build, Stylish as well as Eco Friendly!